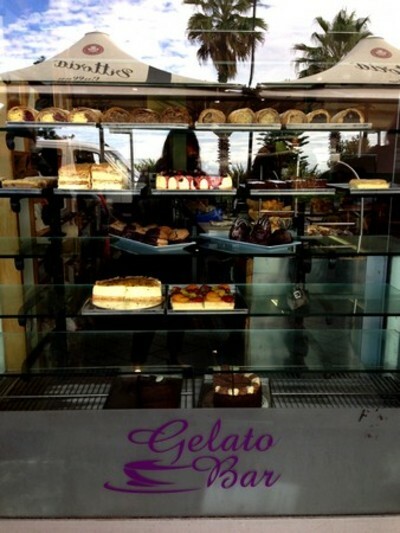 For decades, the Gelato Bar along Bondi Beach’s Campbell Parade has prided itself on producing some of Sydney’s finest strudels, tarts, tortes and cakes; as well as hearty servings of rich Eastern European cuisine. Owned by the Hungarian Berger family for over 50 years, the Gelato Bar was there to witness Bondi’s shift from its migrant working class roots towards the wealthy upper/middle class enclave that we now know it as. Having survived the steady gentrification of the suburb, the Gelato Bar stands as a testament to the migrant roots of the area. While the Gelato Bar does indeed serve gelato, what the café is renowned for however is actually its authentic European delicacies that include Hungarian cherry and sweet cheese strudel, Austrian sacher torte, German poppyseed cake, and the comforting peasant dishes of matzah ball soup, goulash and borscht. 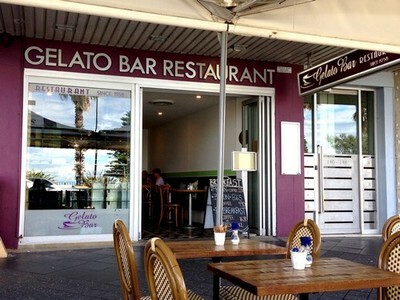 However, after Peter Berger’s retirement and the sale of the Gelato Bar some two years ago, new management has eradicated most of the Gelato Bar’s Eastern European heritage and replaced it with the same generic meals that are served at almost every café across the city. While the main meals served at the Gelato Bar are generous and tasty, they are now on par with the dozen other cafés along Campbell Parade. 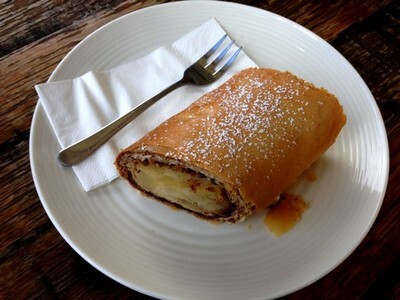 However, what still sets this café apart are the sweets; with the glass-fronted store still showcasing bulging, flaky strudels, towering tortes and decadent looking cakes. The stunning view across Campbell Parade, and out to the Pacific Ocean. Taking a seat at one of the Gelato Bar’s outdoor tables that look across Campbell Parade, down the grassy verge and across to the sparkling Pacific Ocean; the glorious view cannot be faulted. Friendly wait staff deposit worn menus on the table and leave you to mull over the arduous decision of which sweet treat to savour. The decision however is made infinitely easier after you’ve been informed that out of the 44 strudels, pastries, cakes, cookies and slices listed on the menu; only a disappointing 20 or so are actually available. In keeping with the café’s heritage, a few traditional menu items have managed to survive, with half a dozen different flavoured strudels (all $7.80), including apple, cheese and cherry and walnut still taking pride of place atop of the café’s glass window display. The apple strudel portion is generous, easily enough to share between two. The filling in the apple strudel is tender, but not mushy, lightly spiked with hints of warm cinnamon and nutmeg, and wrapped in a delicate golden pastry. While the filling is slightly tart and delicious, the pastry, despite the golden colour and distinct buttery taste, just seems a little limp on this day. A little lacklustre; the hazelnut and chocolate torte. Sadly the towering pyramid torte that the Gelato Bar is renowned for is not available on this day, nor is the chocolaty sacher torte. 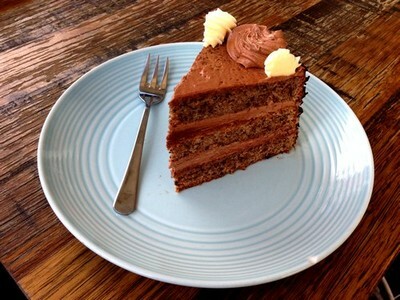 Opting instead with the hazelnut torte ($7.80) proves a double disappointment. For the price, the potion seems a little meagre. The cake is dense and a little dry, and the buttercream icing, while creamy and not overtly cloying, tastes of little. 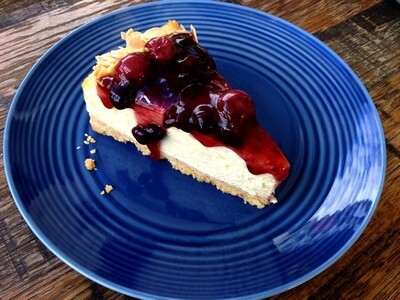 The berry cheesecake is rich, creamy and decadent. The berry cheesecake ($7.80) fares much better. Edged with flakes of crisp roasted almonds, the cake is creamy, rich and delicious, piled high with glossy burgundy berries. 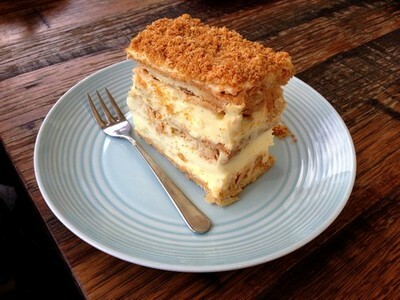 The vanilla slice ($7.80) is equally as delicious, with leaves of golden pastry, unfathomably still crisp, and silky crème patisserie sandwiched together to produce a towering treat that is ridiculously difficult to eat with any air of finesse. Small businesses have come and gone throughout Bondi’s colourful history, giving way to large multinational corporations; yet the Gelato Bar has survived. While a visit to the café is still a pleasant experience with the friendly staff, stunning view and generous portions; sadly what remains of the café’s half a century legacy is merely generic and a little average. 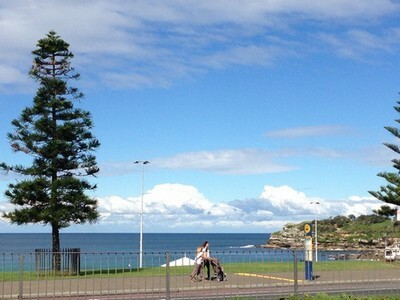 Where: 140 Campbell Parade Bondi Beach NSW. Why: Great location, friendly service and tasty meals. Cost: Breakfasts from $3.90 - $14.90. Lunch and dinner from $13.90 - $29.90, and sweets from $2.50 -$7.80. When: Monday - Friday from 9am - 9pm, and Saturday and Sunday from 8am - 10pm. Good for kids: Yes, there is also a small kid's menu available. Take away: Yes, drinks, gelato and sweets are all available to take away. Loved the Gelato Bar under the previous management team - it was brilliant food. Absolute shame to see what has happened to it. It's no different from any other 'average' cafe along the strip. Once the old clients realise this and stop visiting, I'm sure the current Management team will get the hint. And now it's being renovated.